A little over a year ago, fate introduced us to a nonprofit that was called Santa's Elves at the time. They were going through a rebrand and a name change when our paths crossed and their mission intrigued us. 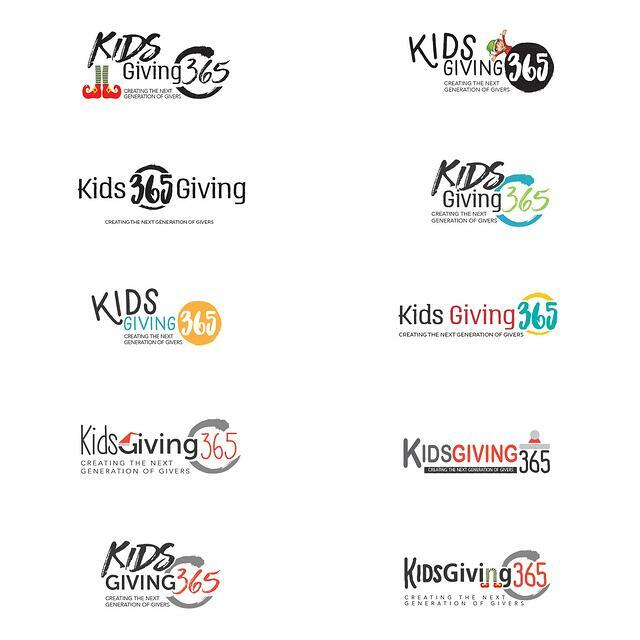 Based out of Denver, Colorado, the KidsGiving365 mission since 2010 has been to inspire life-long giving in children of all ages. What sets them apart from organizations such as Angel Tree, Make a Wish Foundation or Toys for Tots is that their primary focus is on kids giving directly to kids. Toys are not dropped off into a barrel, never to be seen again. These toys are given directly from one family to the other. With their family matching program and recreation center meeting locations, the giving families and the receiving families get the rare opportunity of meeting each other and really experience the joy of giving and receiving. Kulture Konnect was tasked with creating a new logo redesign for the newly renamed organization. We went through many fact-finding meetings and learned about the organization inside and out. We were tasked with a 2-color logo that would represent the non-profit year round and not just in December for Christmas time. Here are some of the original concepts! 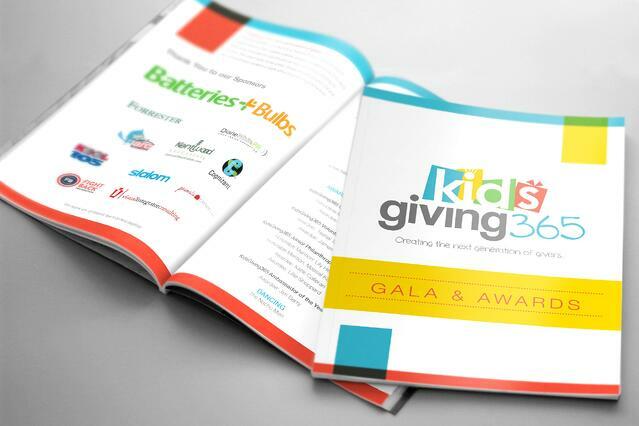 Unfortunately, we did not win the logo design, but this is part of the business world so without a flinch we forged on with our relationship and created their stationery package and the giving poster with the awesome logo that they landed on. 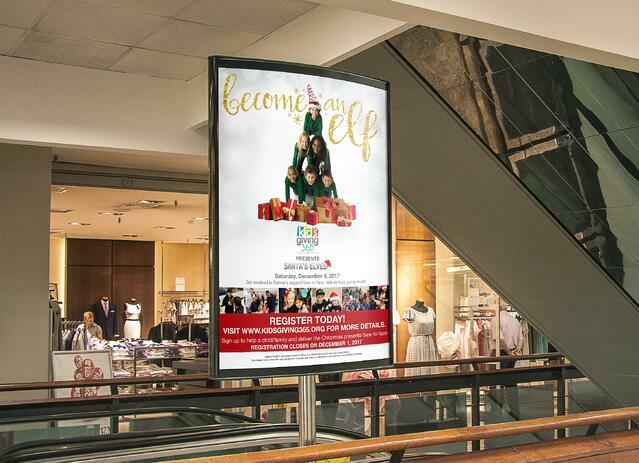 The poster depicts a group of children dressed up as elves, having fun and getting into the giving spirit. 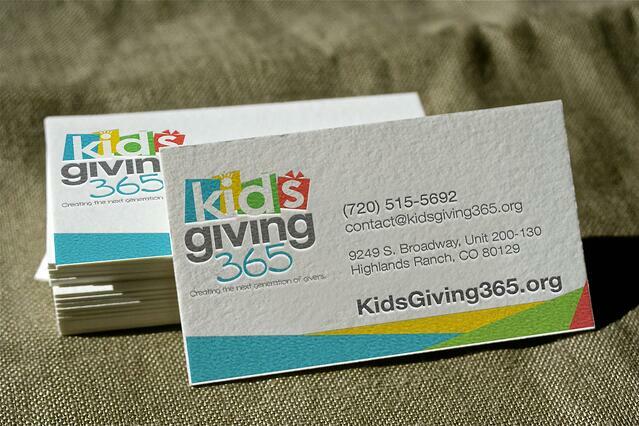 Last year alone over 1,400 kids gave through the Kids Giving 365 events and over 2,500 kids received gifts. Once the big December event was completed and deemed a huge success, we got to work on their annual report which you can find here on their website. This project was a real joy to work on because of all the fun colors and the joyful design. 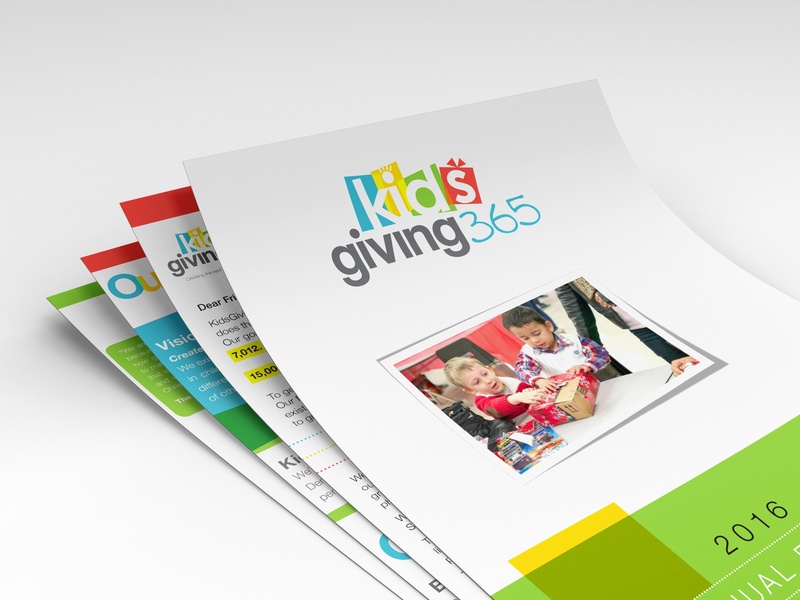 KidsGiving365 was very organized and gave us all of the pieces to work with up front. We thoroughly enjoyed working with them on this project. Truly, they are an organization to get excited about. There is nothing more pure during the crazy busy holiday season than the act of giving. And what better way to experience this than teaching your children how important it really is. We are so honored to be working with such a generous organization and hope to work with them more in the years to come. If you would like more information about getting involved and giving back to the community, please visit their website today!